I love coincidences like that.� Take it as a sign and break out the candy thermometer.� Even when it doesn’t quite work, I had a batch of watermelon that never set fully, it’s hard not to feel happy with jewel colored candy. Hot sugar definitely scares me–I respect its power! 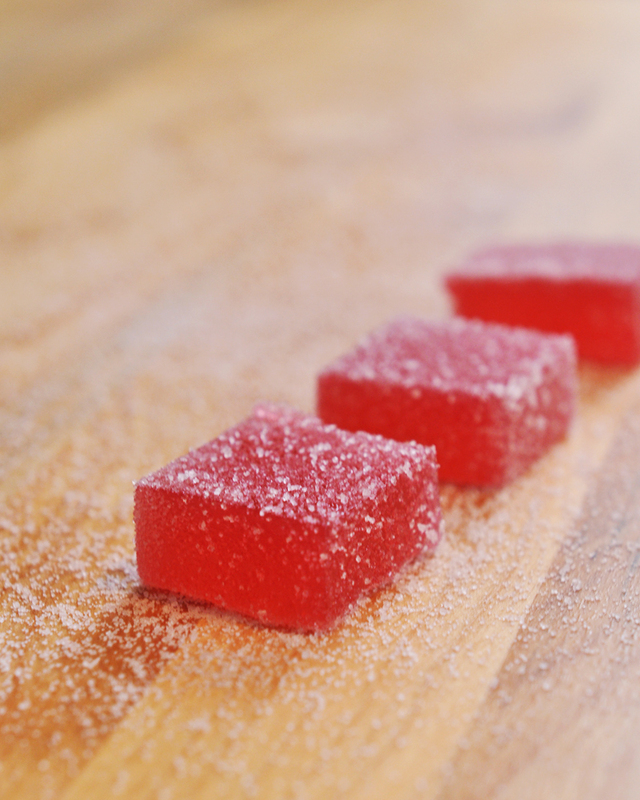 But homemade candy is just so awesome that I may need to overcome my sugar phobia. Jenna, the best part about this recipe is that you don’t have to do anything like caramelize the sugar.� I get that wrong every time.� This is way more fun. I wish it was rhubarb season. Soon, very soon. just last night i tried something like this at a fancy schmancy restaurant, it was apricot + ginger and it crossed my mind that it’d be cool to recreate something like that. and here it is, you’ve posted a recipe! where would i get liquid pectin? I got my at the grocery store…might have even been Wegman’s.� Or if you can wait until I see you next, I can bring you a pouch or two.� Take this as a sign that you need to make some candy. The wheels are spinning in my head and the smoke coming out my ears is spelling Meyer lemon pate se fruit! Ohhh, I like the way that sounds.� I feel like you would need to adjust the sugar since Meyer lemons don’t need as much help in the sweetness department as rhubarb.� I bet the google could help answer that question. I’m so very glad you tried and enjoyed these! They are one of my favorite spring treats as soon as rhubarb is in season. Yours look lovely!! Tracy, thanks for the inspiration.� I brought these into my office and everyone was quite impressed.� Which is funny since they aren’t all that hard to make! And yes, if my birth certificate is to be believed, I truly am 40. These sound so delightful. Do you keep them in the fridge?